So, it’s almost over…January 2015. How’s it been for you? Have you settled into the New Year? Are your plans, resolutions, and spaces of change unfolding as you had hoped? I am feeling a bit stunned by my January. It hasn’t really rolled out the way I had thought it would. The “clean slate” has quite a few words written on it already. What a smattering of words, right? They all have stories and pieces of my reality tied to them. Early this month my Mom was admitted to the hospital. She’s had some issues with her heart. One morning as she stood in the kitchen contemplating whether to make her toast or latte first she nearly collapsed before my Dad helped her into a chair. A moment later they got a call from the heart monitoring service to head for the ER. Over a week later she was finally released. The interim days left me feeling every inch of the 2000 miles that separate us. The $1000 ticket held me at bay from “jumping on the plane” to be there; we all discussed the possibility of my coming and decided together a visit after she was released was what we would hope for. That same week a new friend of mine lost her husband…quite unexpectedly as they were out walking one morning. A terrible accident near our home affected over a hundred cars and another announcement of a call to hospice signaling the end of a precious young mother’s life all left me feeling acutely aware of the gift of life and the reality of death. Katy’s wedding is certainly on my “slate”. Dresses, invitations, flowers, catering, save the dates, shoes, accessories…. and each precious moment of it all to be felt and savored. Watching she and Aaron begin to build their life together is an answer to prayers prayed for many years. And, the goodness of it all mingles with the distance between us and some who’s faces feel so important for me. Faces with eyes that remember and know, who my girl was twenty years ago; it is bittersweet, my favorite kind of chocolate, rich, velvety and layered with flavor. It leaves me wanting to gather up “my people” and have them all nearby. I wrote about reconciliation on my personal blog recently. It’s a word that’s been particularly present in the past year, showing up in ministry, personally, in a work context, and with some I mentor. It’s all had me pondering and still does. There are some unexpected things, things that I don’t want to disclose online, even though I love this community of women dearly. Tender and concerning things, that are being held in a sacred space, with only a few gathered into the “knowing”. They leave me wondering and wanting, aware of my strength and equally aware of my vulnerability. It is a place where anger, disappointment and gratitude are all co-existing. A friend holding the space with us said to me last week, “It’s like you’ve fallen down the rabbit hole and there’s no way of knowing what’s coming next…it’s a bit mad.” Yes. Saturday I went to the grocery store, holding inside of me all of the above. I wandered the aisles trying to piece together the meals for this week. I felt myself wanting to ease what feels heavy, considering what would be “fun” or “enjoyable” that I could drop into my cart. As I stood at the check out unloading my choices I placed three containers of flavored creamer on the belt. 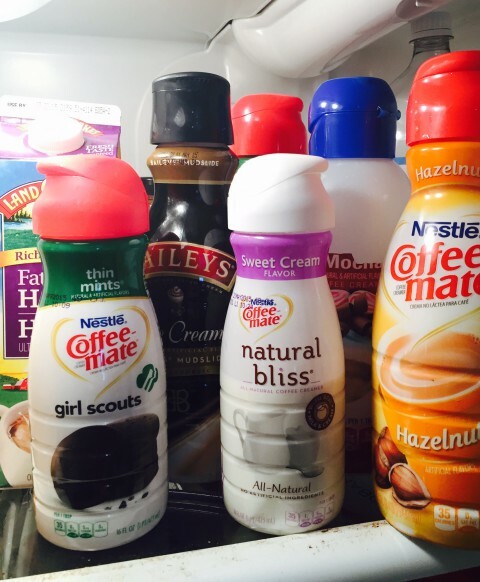 I knew in that moment the truth…those three creamers would join the four or five other bottles of creamer in my refrigerator at home. Comfort in a plastic bottle, 35 simple calories poured into my cup in the morning, a taste of something enjoyable before walking into another day. Seven bottles of coffee creamer in my fridge is not normal for me, not normal at all, they are saying something about the condition of my soul. I want you to know that I noticed, and I’ve been holding the awareness of it each morning as I pour my coffee, paying attention to my heart and to what that trip to the grocery store exposed. Sunday we went to church. The whole experience was so good: the music, the message, and the communion time where we stood arm in arm with dear one’s. The theme of the morning message, we are healing, and we can bring healing. I believe that. The girl sitting in front of me had a tattoo at the base of her neck that peeked out from under her dark hair a couple of times, “We’re all Mad Here”. It made me smile as I sat listening and holding all that is real in my January. And here I am. And yes, we’re all mad here. Tracy Johnson is a lover of stories and a reluctant dreamer, living by faith that “Hope deferred makes the heart sick but when dreams come true there is a life and joy” (Pro. 13:12). Married for 28 years, she is mother to five kids. After nearly a half century of life, she’s feeling like she may know who she is. 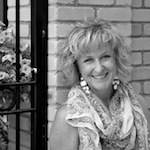 Founder of Red Tent Living, she writes here. It is always sweet to connect with you my friend, even if it’s through the Internet! Miss you. Your words let me know that your heart is full …..your mind is full…….your days are full…..your calendar is relentless……your demands are never ending…..your desires are feeling heavy …..your longings are on ‘hold”…..and play feels so far away! I am holding you close and tenderly ! It is good to be held closely by your kind heart Elaine. Thank you. The amazing thing to me about Wonderland (which we named our new home in Indianapolis) is that it holds both “madness” and Bright glory. I love how you embrace every bit of where you are, Tracy and all your heart contains. And, that you share it so freely with us. Grateful. I love that you’ve named your home as wonderland, the both and do leave us wondering, don’t they?! Grateful to know I am in good company with you there. 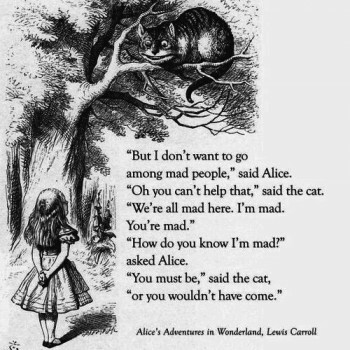 Well, you know we’re all mad here too…so I’m with you! Love this, love the acceptance of the madness of all that is on your “slate”. You are one of my most favorite mad faces….so glad to have you in my mad world! Thank you Mary Jane, I like the idea that I am wearing well…leaves me smiling. Sweet to the soul to read……so rich like the tasty creamers. Our souls do need the richness don’t they!?! Glad to know my words today were sweet for your soul. Thank you for the wonder of your words. It sparks words and journaling for me. Looking forward to some time today journaling about my January and its fullness of both joy and heartache. And another quote from Wonderland that is all too familiar and not a welcome one……I’m late I’m late…..the rushing that implies that is often so unnecessary and life stealing. There are so many good quotes from Wonderland! I hear you on the rushing that is unnecessary and life stealing, that could be another whole post from me for sure! Blessings as you journal Jaimi. Just read this quote: ” She is mad, but she’s magic. There is no lie in her fire. “. Charles Bukowski. You. Tracy, this quote captures you . Love that quote Michelle. I so want for that to continue to be true for me in the days and weeks ahead. Love you and your wise words (and quotes) for me. Thank you for sharing your heart and what you are holding. Just want to give you a long hug. I’ll take that hug in a few days my friend!!! It’s understandable something as real and full of honest life, Red Tent Living, has been birthed through you Tracy. You being life in the chaos, offer hope in the madness and give us the truth of love and life lived well between the cross and the coming. We are mad together. Keep showing us the way forward. Thank you Valerie…hope in the madness…yes. Just so you know being a little “mad” is a qualification for friendship! 😊 there’s so much freedom in that reality! Laura, thank you for your words and your prayers…I will receive them wholeheartedly. Blessings to you. It’s a mad, mad, mad, mad world. I love that the tattoo was a reminder right when it needed to be! We are truly all mad here. There is comfort to me knowing that… Knowing that it’s okay for life to feel that way and still find so much joy in moments we don’t control. God is present! Yes! Feel the madness and the joy! Me too Anna.